I know I probably say this every single year, but I can't believe summer ended so quickly! I feel like the end snuck up on me this year and while everyone is obsessing about pumpkin spiced lattes and getting ready for fall, I'm in denial that these are the final days of my favorite season. Who else is with me?! Anyway, I decided to try out some nail out using my favorite summer colors while I still can before I throw burgundy and grey shades into the mix. Check out the results I came up with using a little striping tape! It was super easy and didn't take long at all. For the pink nails on my right hand, I used Sinful Colors' nail polish in Cream Pink. The base for the silver accent nail is Zoya's Nail Lacquer in Hazel and the white nail is OPI's Angel With a Leadfoot. To create thicker stripes on my left hand, I doubled up on striping tape and painted over the Cream Pink base with Hazel. For the other accent nail, I laid out the striping tape in a criss-cross design. I love how this manicure came out and I got compliments on it the whole week, which is always a plus. What type of nail art are you guys into lately? Let me know in the comments! Hope you're all having a lovely week so far. I wanted to share with you two costumes that I attempted for Halloween. The first is a Mermaid look that I wore during the day, I went super glam with this one and I loved the end result. To get the look of the scales, I cut fishnet stockings, placed it against my skin, and patted eyeshadow on top of it to create a gradient effect. The second look is a Pop Art Zombie. I've never played around with makeup that was this dramatic before, so it took me a little while to apply everything (2 and 1/2 hours to be exact!) , but it was totally worth it. What are your thoughts on these costumes? Let me know what you think in the comments! If you know me, you know that I love, love, love Pinterest! Not only is it a great site for looking up fun DIY projects or inspiration, it can also be an important tool for us bloggers. A single pin can get hundreds of people visiting your blog and posts. I've received so much traffic on Thrifty Belleza thanks to pins like this one that you might recognize from my Milani Lipstick Review. It was repinned 243 times (!!) and weeks after I first uploaded it, it is still in the first row of search results when you search "plum lipstick tutorial". What made this pin so successful was picking the right keywords to include in the photo caption. When I make a caption, I try to include keywords that I would search for if I were looking for makeup tutorials. In this case, I narrowed it down to "plum color lipstick tutorial". It's also important to put the main keywords at the beginning of your caption because Pinterest's search engine algorithm weighs the first three to four words heavily when picking which pins show up in the search results pages. It's super important to change the filename of your pictures before uploading them to Pinterest! Make it descriptive and concise so that it describes your pin in 3-4 words. Also, add the word "Pinterest" before your filename because the Algorithim recognizes this which also helps bump the picture up to the top of the search results. 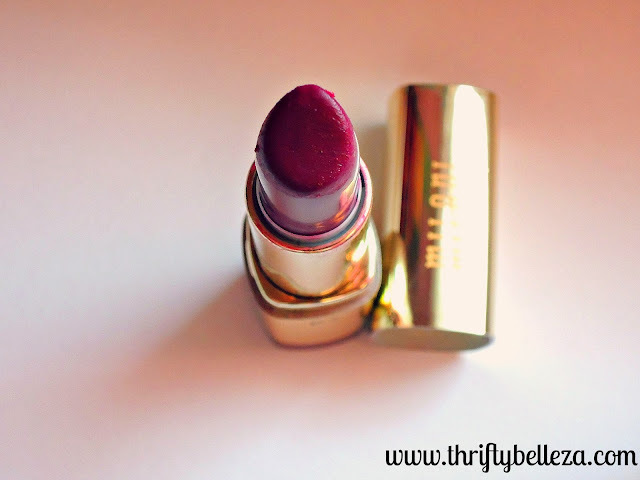 For example, I renamed my picture "Pinterest-Plum-Lipstick-Tutorial" which is way more search engine friendly than the default name of "blogpic1". Pins that have clean, crisp looking pictures accompanying them do way better than the ones that looking blah or all over the place. I didn't go out running to buy some expensive Photoshop software of DSLR to do this, but I did put a little work into making my pin stand out. To get clear images, I took tons of lip tutorial pictures by my window with natural lighting coming in. 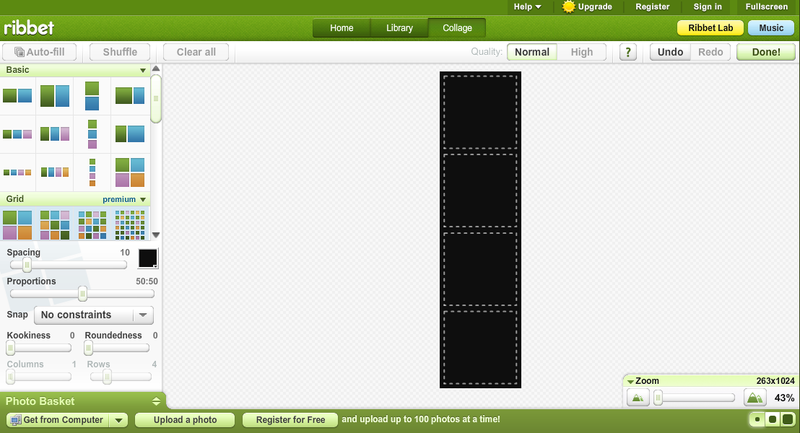 I picked the 4 best ones and uploaded them into a free collage creator on Ribbet. 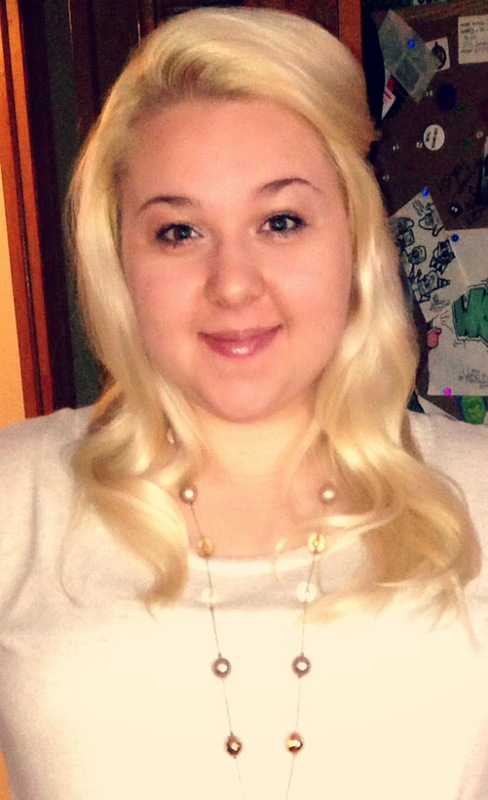 You can use PicMonkey too, but I like this one because it gives you the option for a vertical photo collage. Vertical images get more attention on Pinterest than horizontal pictures. I fixed the lighting using the photo editor and added words with steps for the tutorial which also helped make it eye-catching. Direct Pinners to your blog by adding a url link to your blog or posts. Even if by accident, as soon as people click on your picture, they'll be taken to your blog. It makes it so easy for them to find you and know the source of the pin. If you have lots of images that you're proud of on your blog, I recommend installing a "Pin It" button so that other people can pin your images to their boards when they visit your site. Use this button builder with detailed instructions on how to install it into your blog's html code. This is another awesome way to get traffic because the easier it is for people to share your photos, the more likely others are to see them and spread the word about your blog. I'm so excited to share a new post with you guys on something slightly different than makeup tutorials! 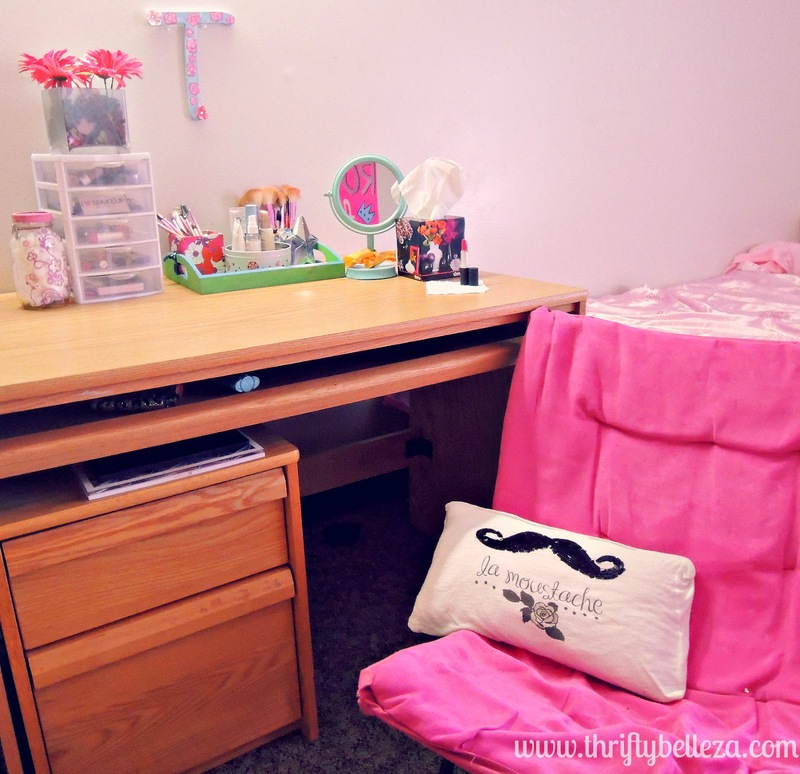 Today I'm turning the focus on redecorating your home or office space for the spring. 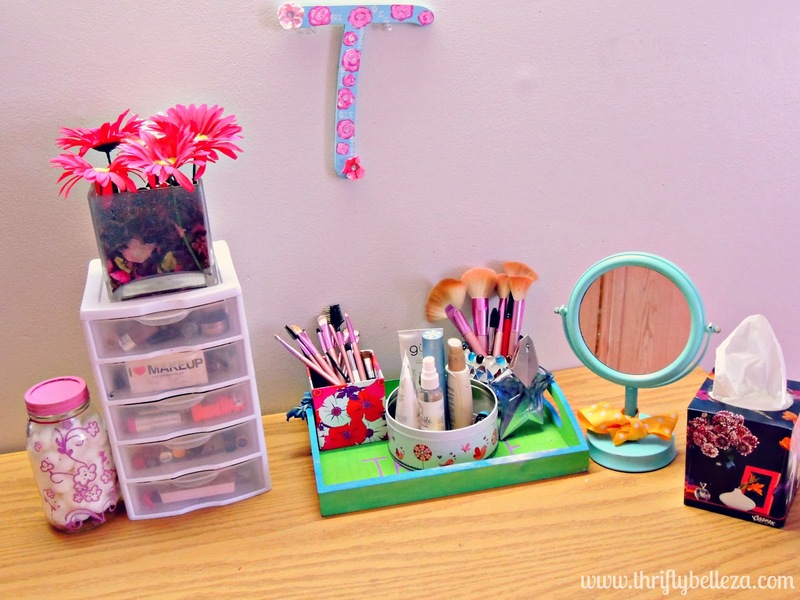 I love this time of year when the weather gets warmer and take advantage of it by transforming spaces like my makeup vanity. 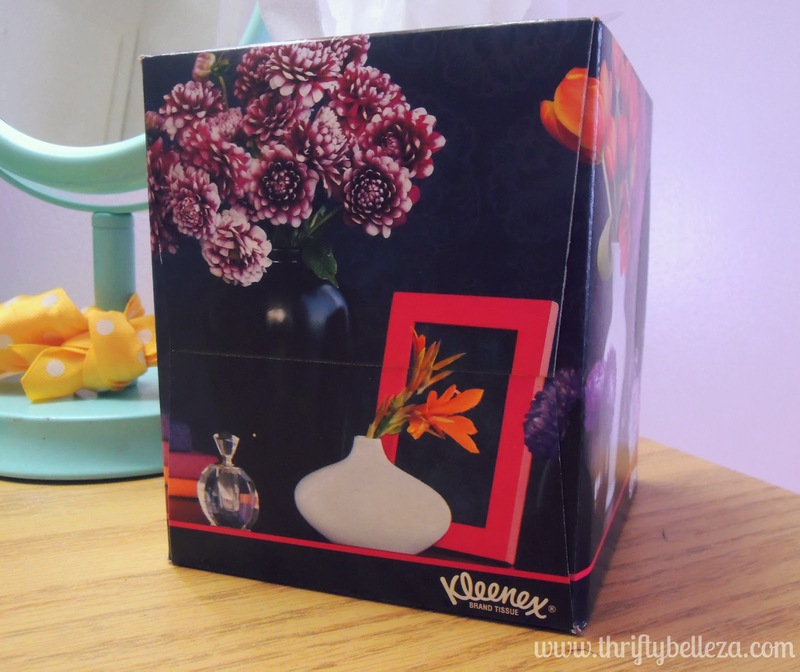 I always keep my apartment stocked with tissues because of my seasonal allergy symptoms, so when I was putting together my vanity, I had to accent it with this fab Kleenex tissue box from their new Style Studio Line! If there's one decorating tip that I have, it's that it's important to have pieces that are functional, like these Kleenex tissues. Not only do they have a fierce design, they're also an affordable way for me to add a pop of color onto the vanity. As a broke college student, I can't afford to buy expensive decorative pieces, so this box really helps liven things up. Kleenex are also versatile and can be used throughout your makeup application when blotting away any extra lipstick or wiping off mistakes and smudges. 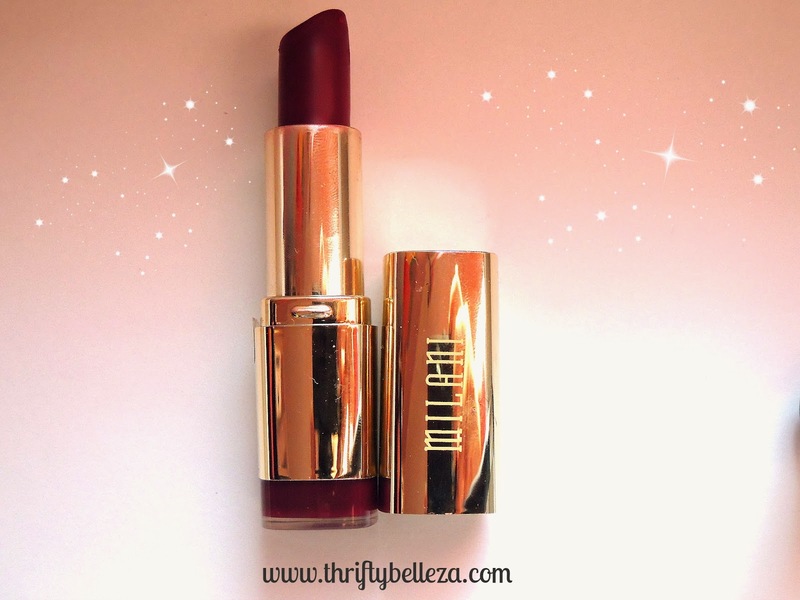 *Belleza Tip* Blot lips after applying lipstick to make it last longer. Check out the Kleenex Style Studio and take the Style Quiz to find out which box style fit your needs the best! After taking the quiz, you can also earn a coupon that you can use to buy your favorite design. 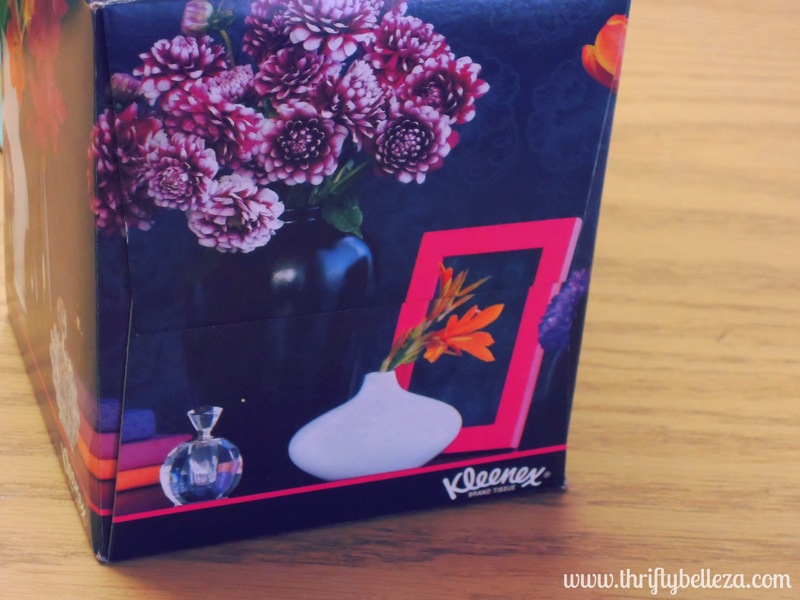 When I checked out their site, I learned so many cool things that Kleenex can do besides saving a runny nose. They can be used to dry makeup brushes, or to wrap between your toes to protect a pedicure from smearing while it's wet, among dozens of other uses. I'm such a sucker for florals, so the design on the packaging immediately caught my eye. I decided to keep my vanity simple with my favorite makeup items stored in clear plastic drawers. My eyeshadow and face makeup brushes are stored in separate colorful containers. In the middle I keep my daily moisturizer, lotions and primers so that they are easily accessible and I set everything on top of fun green tray. The turquoise mirror is an absolute must to get the most precise makeup application. 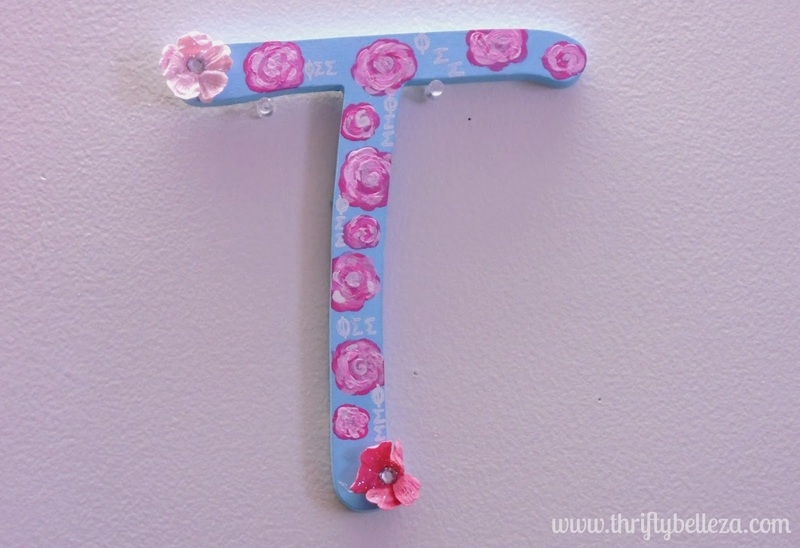 Finally, the daises (fake) and letter "T" initial were gifts from friends that helped tie the whole floral look together. If you're looking for the perfect pop of color to any Spring time renovations around your house, Kleenex is definitely an affordable and useful option. To find a stylish box near you, use the Kleenex Store Locator here. What pieces do you guys like incorporating into your home when you're redecorating? This is my first post of the new year and I wanted to kick off January by showing you guys the second part of my review of e.l.f. 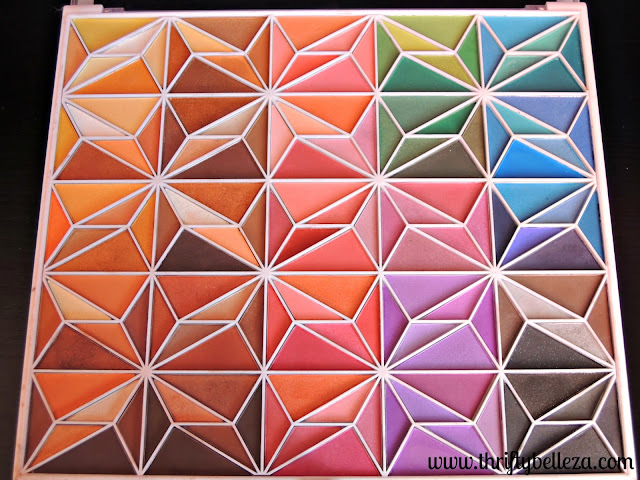 's 150 piece Geometric Eyeshadow Palette. You can read part 1 of my review here! Right off the bat I'll say that this palette is only $15 and is worth every cent. A little back story to how I got my hands on this palette. Ever since I heard that e.l.f. released this palette after checking out their Instagram page and reading reviews about it on other beauty blogs, I knew I had to have it. I immediately fell in love with the geometric design and found it so unique. I know some people complain that some of the pans are too small to fit a brush in, but I never really had that issue with this palette and found each pan to be roomy enough for my brushes, but that's just my personal opinion. Anyway, I was so excited when I walked into Target with my boyfriend and found it for just $12 as opposed to the average retail price of $15. This was during the holidays, so the sale is no longer available, but at $15 it's still a bargain. I was practically running down the aisle and jumping up and down when I found it because I had been looking for it everywhere since there aren't that many stores by my area that carry e.l.f. 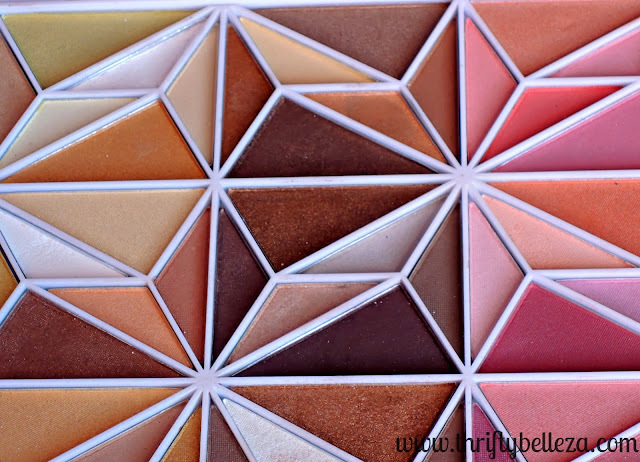 Even though this can technically be considered a holiday palette, I still think that it makes a great palette to add to your eye shadow collection for the new year because there are some shades in there that never go out of style. For starters, you get 150 shades in this palette a.k.a. pretty much every shade you'd ever need, LOL! As you can see from the photo above, the left side features mostly warm brown and gold shades shades and a few whites (perfect for highlighting the browbone). 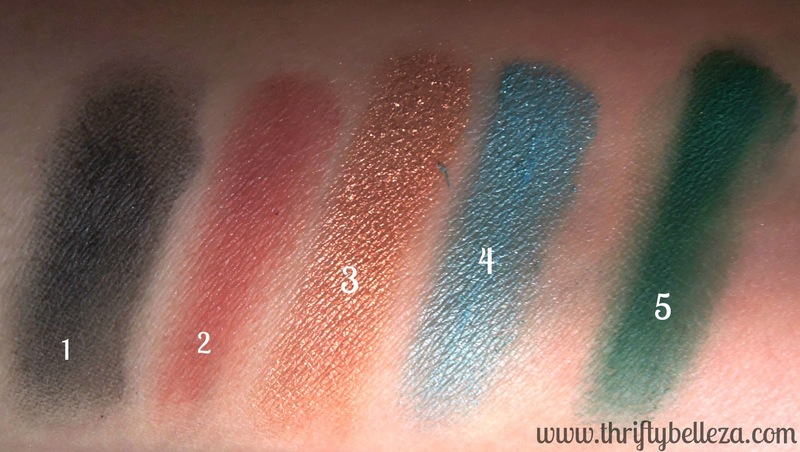 The right includes cool tones like blues, purples, pinks, greens and the bottom right quadrant has matte and shimmery blacks. 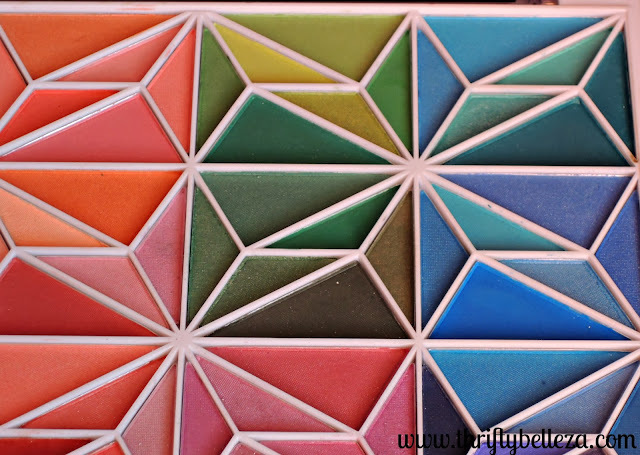 I will say that something that I was dissapointed of with this palette was that there was no super pigmented red, hot pink or bright purple, but if you're not looking for those colors it's not a big deal. Cool greens, blues, pinks and oranges in the upper right quadrant. The real stars of this palette I feel are the green, blue and brown shades. 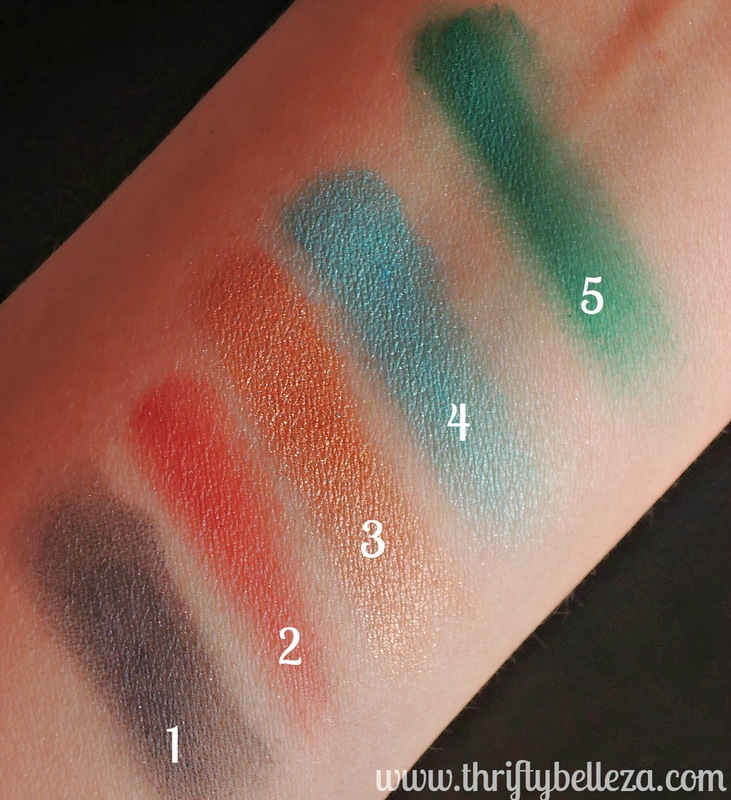 I haven't been able to play around with every single shade in this palette yet, but these are the ones that stood out to me the most because of their awesome pigmentation and staying power. A closer look at the brown shadows in the bottom left quadrant. These are a few of my favorite shades. 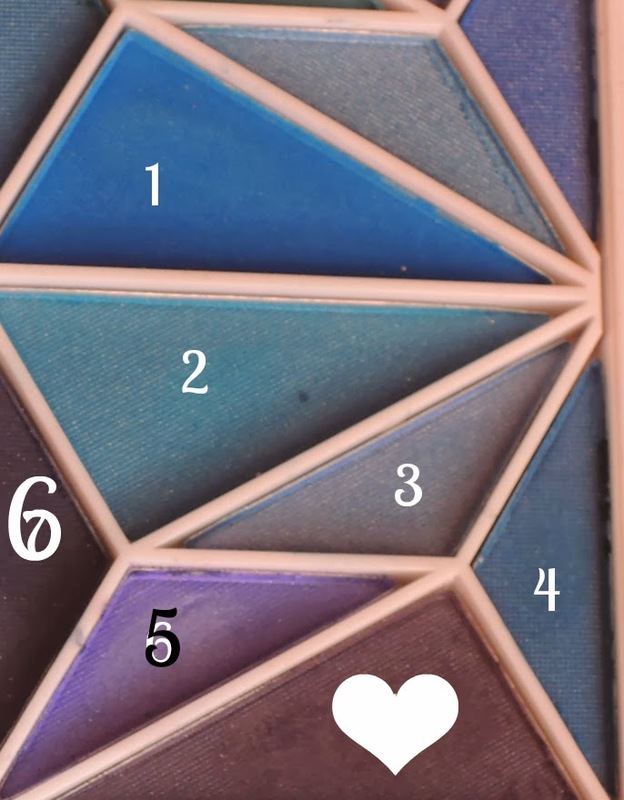 The shadows are numbered from left to right since this palette doesn't assign a specific name to each color. 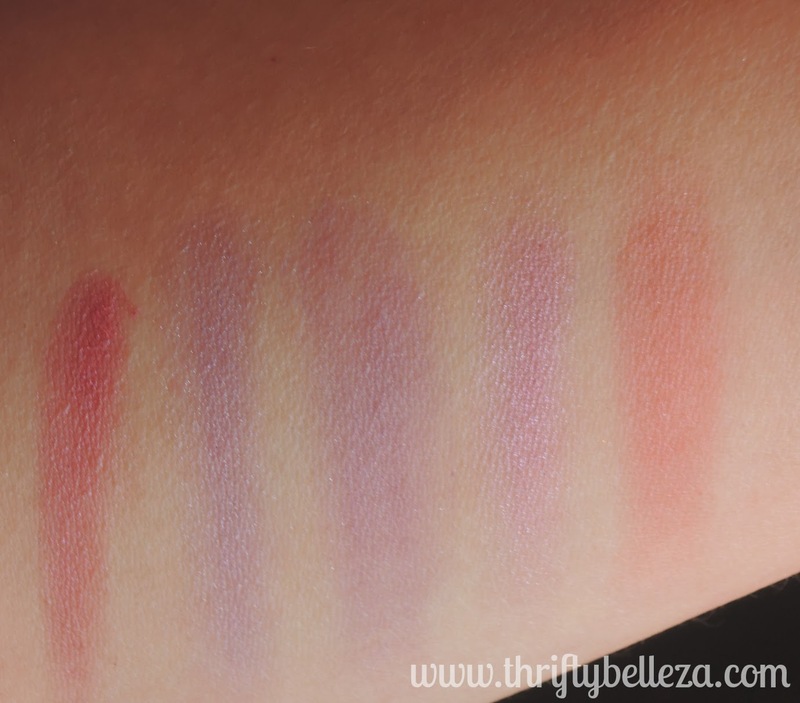 I primed my forearm before applying these shadows and it made a HUGE difference. I strongly suggest priming eyelids every single time when using these shadows because it brings out the pigmentation so much more than if you wear the shadows alone. 1) A black, satin shade. Not very pigmented if you're looking for a true, deep back. However, it does have subtle specs of blue glitter in it that reflect beautifully in the light. 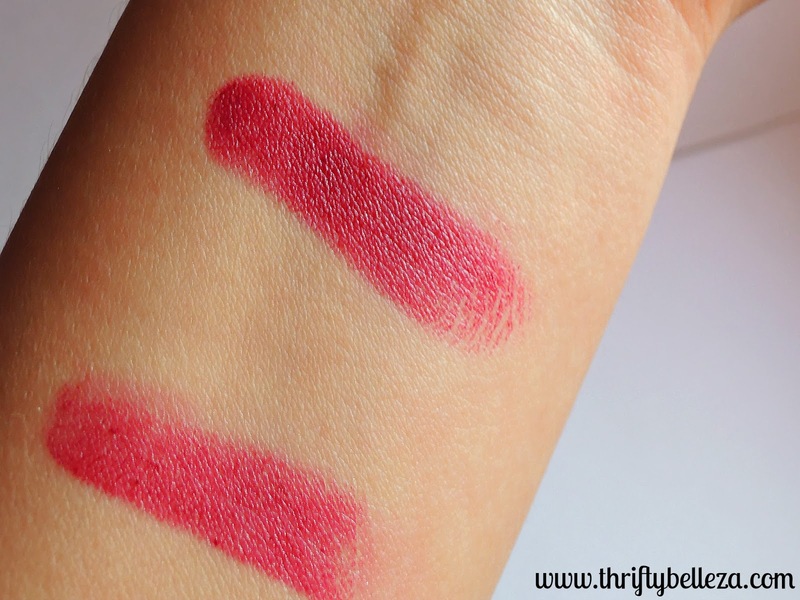 2) This is the closest thing to red that I could find in the palette and is closer to a matte shade. Nice pigmenation with this. 3) A gorgeous copper/gold shade. 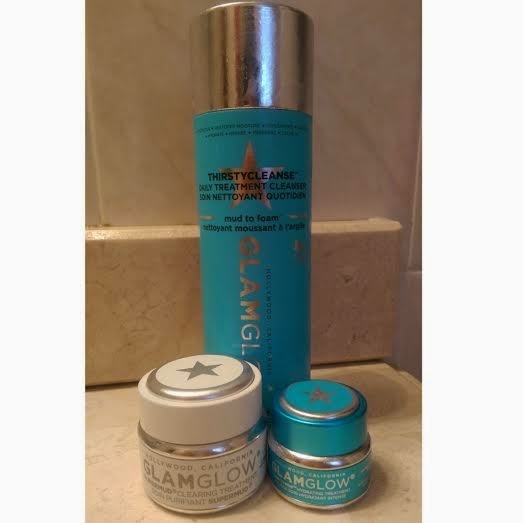 Very shimmery and perfect for warmer skintones. 4) A sky blue shadow. Just as shimmery as shadow 3. I also found some flecks of white glitter in this, but it's not crazy noticeable. 4) A green matte, lovely shadow for winter or fall. It has great pigmentation but even with primer and steady brush application, there is a bit of fallout so beware. A section of the blue quadrant in the palette. 1) Nice build-able blue, very matte with some fallout, but nothing major. 2) A shimmery powder blue, has a slightly purple tint to it. Not hard to apply at all and goes on smoothly. 3) Similar to the powder blue only it's slightly darker and is more of a satin shade versus shimmery. 4) This was probably my least favorite, it came out very streaky for some reason and just looked strange. Lacked pigmentation and would have made a nice indigo if there was more color in there. 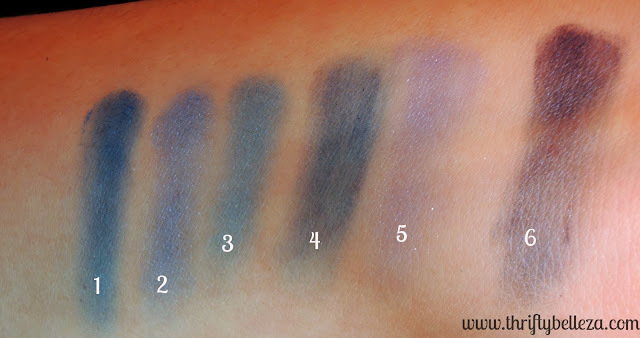 5) A very girly periwinkle shimmery shade, great for those who like just a hint of color. 6) Also streaky like number 4, but this has more pigmentation and has a nice plum/eggplant tone to it. A few of the palette's pinks and oranges. Unfortunately, these also happened to be the least pigmented even with primer and I found that there were a couple of dupes with the pinks. That's a con that I have with this palette because I like having a lot of variety with my eyeshadows, so if you're looking for really bold pinks, this might not be the best palette for that. 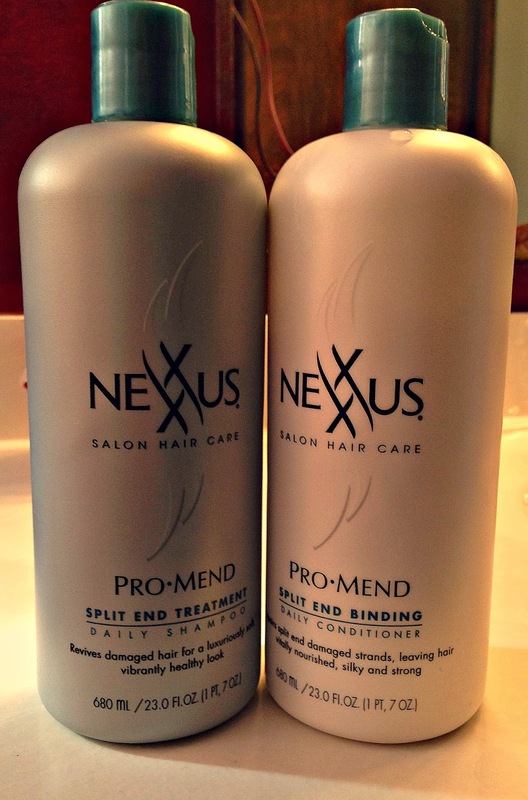 Overall, I strongly recommend this product to you guys because it's a great value for the price. e.l.f. 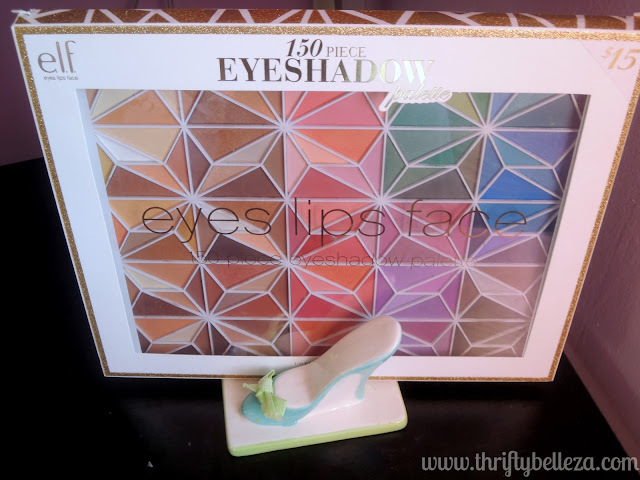 is known for making some quality eyeshadows and this is a perfect example of that. Although there are a couple in there that are lacking in pigmentation or have fallout, for the most part I found that I was really happy with my purchase and add these shadows into my looks on a weekly basis. Two tips I have are to splurge a little on a great primer like Too Faced Shadow Insurance which you can purchase on Amazon for $12.75. Also, use a white creamy eyshadow base to make the colors pop, like this jumbo eye pencil from NYX for $4.50. By combining both of these, your shadows really have something to stick to and it leaves your application looking flawless! 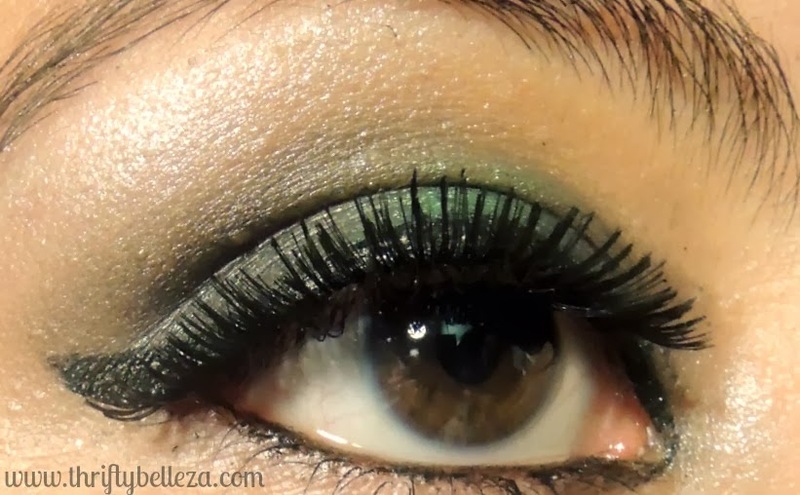 Here's a look that I created recently using a black shadow from the palette in the outer v and inner corner and shimmery green in the center. 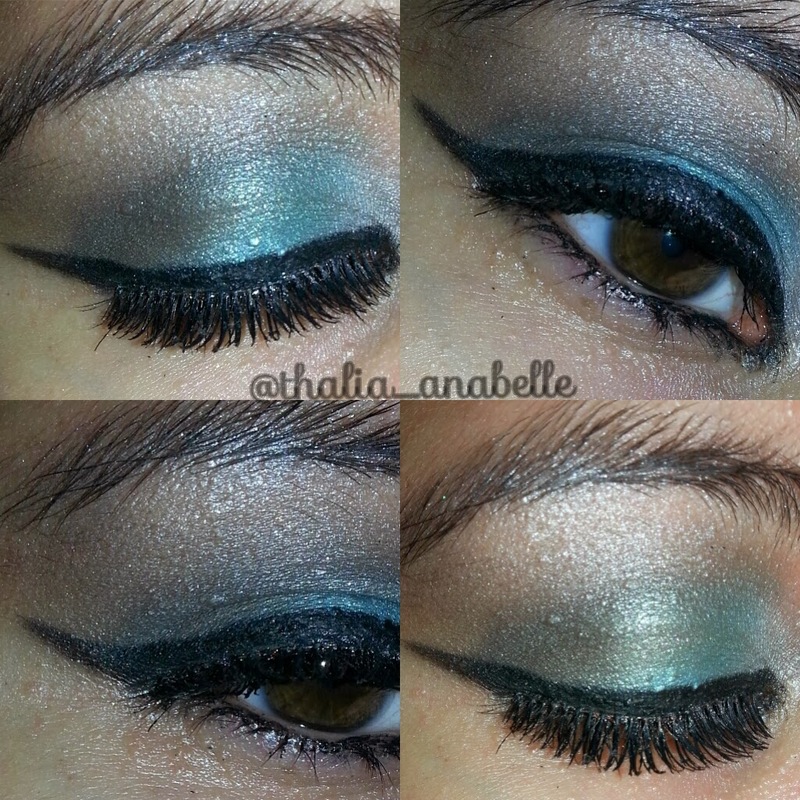 I have 2 more looks from the palette that I featured on the blog which you can check out here. The e.l.f. 150 piece Geometric Eyeshadow Palette can be purchased on e.l.f. 's website for $15 for a limited time. What are some of your favorite must-have eyeshadow palettes? Would you ever buy something like the e.l.f. Geometric Palette? Let me know in the comments! This winter, I'm all about dark lipsticks. I can't get enough of them since I'm not really a fan of using pinks and oranges during the colder seasons. The only problem is that sometimes the lipsticks that I try on are waaaay too dark for my complexion and aren't flattering at all. That's why I was so excited to get my hands on this thrifty lipstick called "Sangria" from Milani's Color Statement Collection. As far as texture goes, the lipstick is advertised as having a matte finish, but I'd say it's more of a creamy matte. My favorite thing about this lipstick is that it doesn't dry out your lips like other matte lipsticks, making it a great drugstore find. However, I highly recommend exfoliating before application by rubbing a toothbrush over your lips to get rid of any dead skin cells. 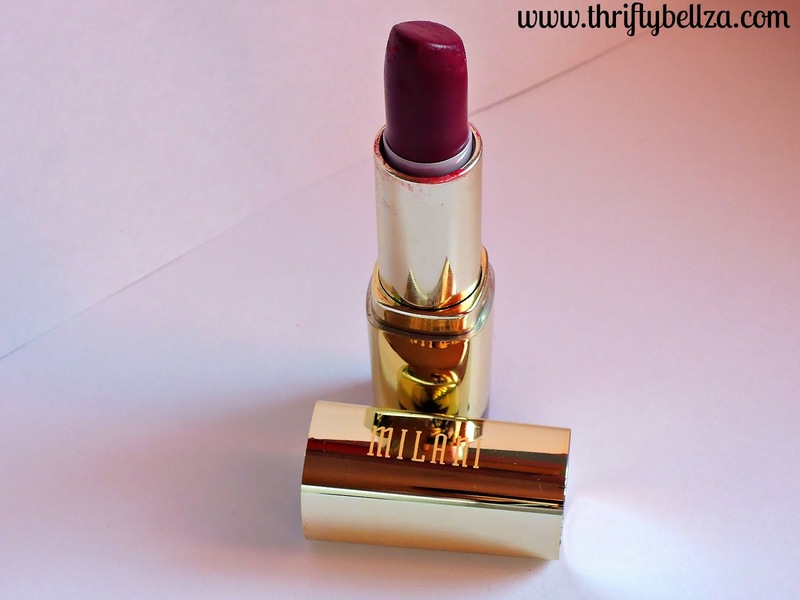 If you apply it all willy nilly, it will leave any cracked skin on the lips looking darker and way more noticeable, so smooth lips are an absolute must when rocking this. 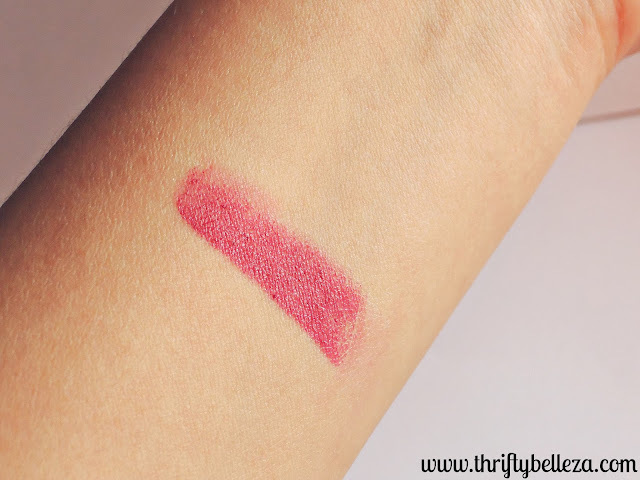 Swatch of Milani's Sangria Lipstick after applying 1 layer. Swatch on top is 3 layers, swatch on the bottom is 1. I also think that the packaging is really elegant. 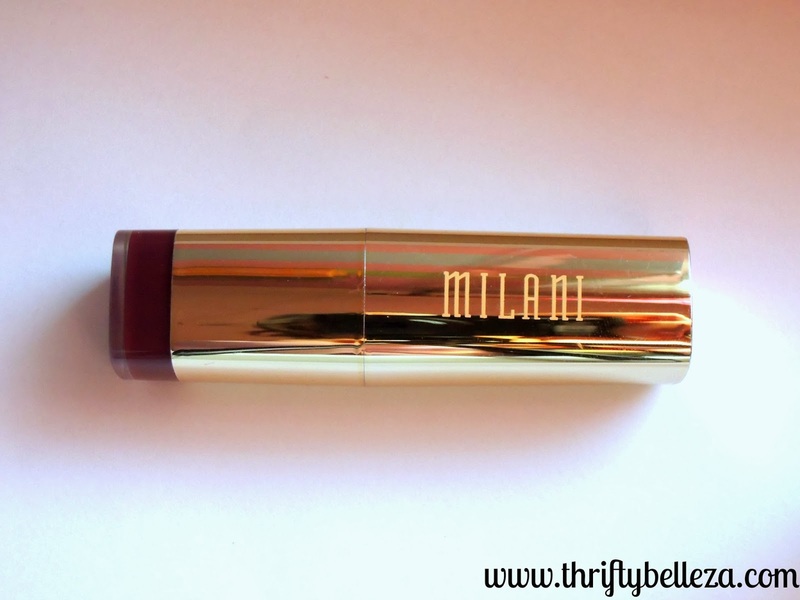 It comes in a gold tube with the signature Milani logo on the cap and it has a clear bottom that shows the shade, so finding it among other lippies a breeze. The lipstick itself also has a somewhat fruity scent to it, which I find to be very light, pleasant and not overpowering. 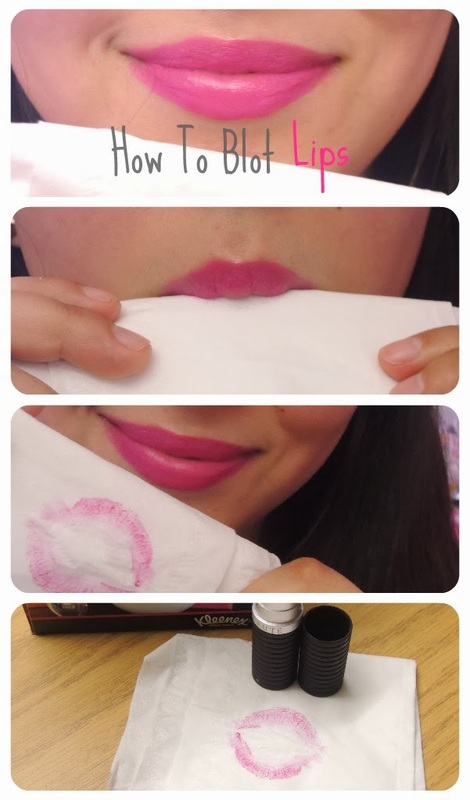 Also, I decided to make a tutorial for you guys on how to get the perfect application for this lipstick in 4 easy steps! 1) I should have added exfoliate and moisturize to the pictorial, but I forgot! Gently pass a toothbrush over the surface of lips in circular motions for 30 seconds. Wipe lips off with a towel. Apply your favorite lip balm to hydrate, I used Rosebud Salve Lip Balm. 2) To ensure a matte finish, apply a translucent powder all over lips using a small concealer brush. I used e.l.f. Translucent Matifying Powder. 3) Line lips the outside of the lips with a lip liner dark purple or pink. 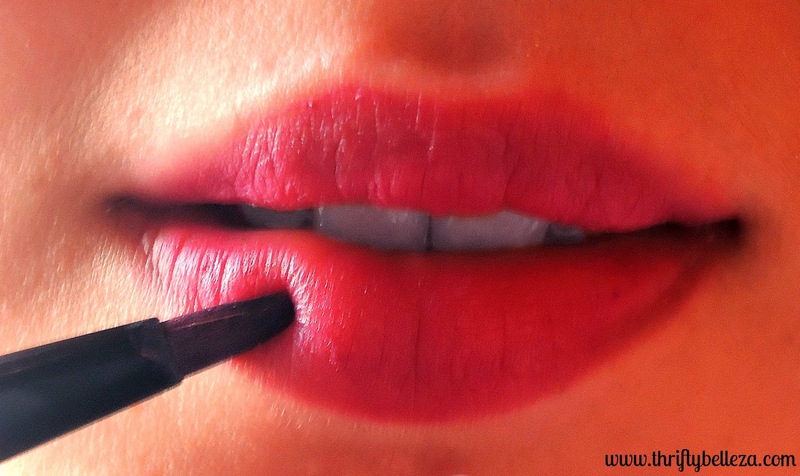 Then apply lip liner to the inside of lips. I used NYX Lip Liner Pencil in Purple Rain. 4) Coat a lip brush with the Sangria lipstick and apply it in strokes starting from the center of lips and work your way outward. I suggest applying at least 3 layers to get the most color, but you can build up the color to your desire. 5) Finish by applying concealer with a concealer brush to the perimeter of lips to clean up any product that has fallen outside of the lines. 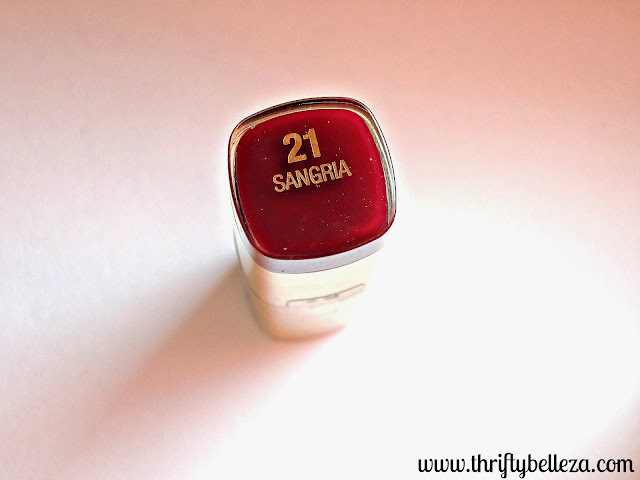 You can find Sangria at most drugstores and you can find it online at Walmart for just $4.97. So tell me, what are your favorite lippies of the season? Are you more of a deep red/burgundy girl or do you go for shades that have a berry/plum tone, like Sangria? Let me know in the comments!